The first weekend in May has become an interesting day in the South. From the blue bloods and FFV's to the good ole boys and rednecks, nearly everyone circles this date on the calendar. 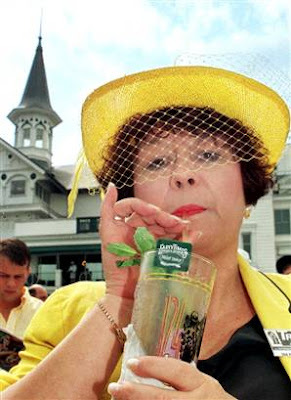 The first Saturday of May is of course when the pinnacle of horse racing takes place, the Kentucky Derby. No doubt Rusty's co-horts here at HHR will be waxing poetic about the ponies in the bluegrass. 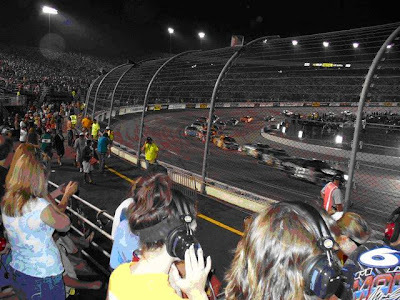 Equally important at the other end of the spectrum for NASCAR fans is the race at Richmond. Located in the capital of the old Confederacy, RIR is one of the best and most popular tracks on the circuit. 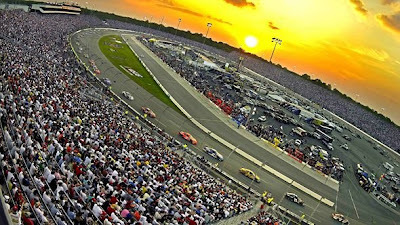 RIR is a three quarter mile relatively flat tri-oval that makes for some amazing racing. Last week, fans saw cars screaming through over 30 degrees of banking topping 200 mph. This week, RIR presents barely 14 degrees of banking with speeds hitting around 150, but the racing will be no less exciting. The short track at RIR requires an ability to brake into the corner and then get good grip out. Turn 2 is where a lot of the action is, as the groove narrows getting out of the corner and onto the back stretch. It's also not the best place to sit, cause the cars hit the gas there, making the noise in the first few rows deafening (ask Mrs. Rusty if you don't believe me ). There are three current drivers with 3 wins at Richmond, Stewart, Junior, and Jimmie. I expect to see them continue their success and they should be running near the front, Stewart especially. The driver of the #14 car has been on the cusp of getting his first win for his new team. Richmond might offer him his best shot. Tony typically warms up with the weather. Other drivers to watch include the shrub, hometown favorite Denny Hamlin (shout out to my fellow Chesterfield fella! ), and defending race winner Clint Bowyer. While Kyle has yet to win at Richmond, he does have the best average finishing position at just under 7. Hamlin and Bowyer are 2nd and 3rd among active drivers respectively. So, whether you are watching 20 some horses in Kentucky or over 37,000 in Virginia, it's going to be a fast and exciting weekend for race fans from all walks of life. He didn't win at 'Dega, but he sure as shoot came close. Now, he comes to his best track. Junior excells at the three quarter mile short track in Richmond. Last year, if it wasn't for the idiocy of the shrub, he'd would be leading all active drivers with four wins, but rubbin's racing. This week, I expect Junior to be back towards the front. He will lead some laps, a lot of them. Barring anymore unforeseen idiocy, he'll be in the hunt at the end. Last week was the start of something beautiful for the 88 team, and this week it continues.